I almost feel like I should do a do-over for this section. 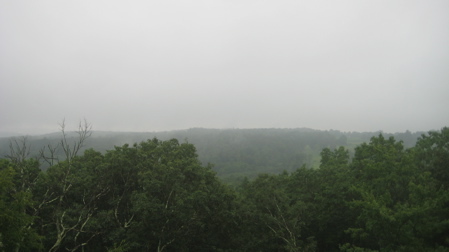 Not only did it pour down rain the entire time I was hiking, but it grew dark prematurely and I didn’t quite make it all the way as far as I’d wanted to make it. Of course, CTMQ readers know that I’ll make up that last little bit of this section soon enough… But you also know how annoying it is to me to have that unfinished bit taunting me. Since I’m a father and husband and supposedly have responsibilities now, I tend to be a bit more cautious in my outdoor endeavors. While I had no issue with picking seemingly the only day in the drought-ridden summer of 2010 that poured buckets upon buckets to go hiking, I did have a slight issue with the massive lightning storm on its way over from the west as well as the absolute drenched pitch-blackness in which I ended up finishing up my walk. 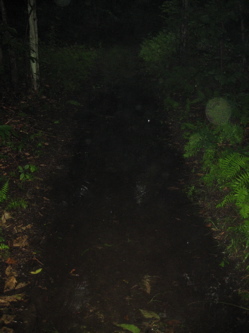 I could have easily walked to the junction with what I’m calling section 1B – the eastern southern tail of the Nipmuck – but it would have been too dark for any pictures – which are already at a premium due to the downpour. The drive to the unmarked trailhead took me down some meandering back roads in Mansfield. I thought I knew all these roads from my cycling days at UConn, but apparently not. The trail here begins on Puddin’ Lane (yes, the apostrophe is official) next to a very large boulder with a tiny little reflector stuck in the ground next to it. Perhaps it was the downpour I was setting out in; I don’t know, but that little dinky reflector made me laugh for some reason. Shortly into the woods, I crossed over into a Joshua’s Trust Property. Joshua’s Trust is one of the oldest land conservation and historic trusts in the State of Connecticut Joshua’s Trust now owns, or protects by easement, more than 4,000 acres of land preserved for the benefit of future generations, making it the fourth largest land trust in Connecticut. 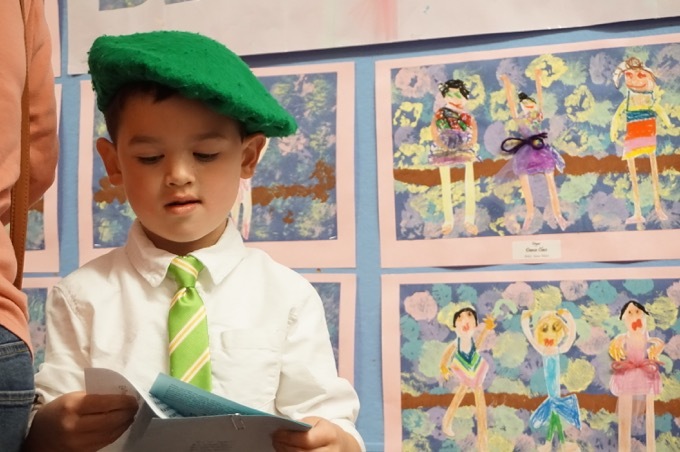 The Trust is named for Joshua, son of Uncas, Mohegan Sachem, who in 1676 bequeathed his hunting grounds in the heart of eastern Connecticut to 16 men of Norwich. 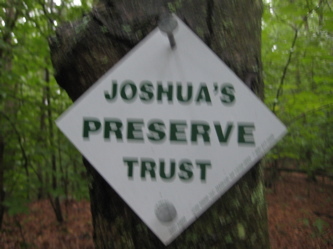 Joshua’s Land Trust serves an area roughly conterminous with the Windham Region, including the towns of Andover, Ashford, Chaplin, Columbia, Coventry, Hampton, Mansfield, Lebanon, Storrs, Tolland, Willington, Woodstock and Windham. You can, and should read more about it here. In addition to that, I’d be enjoying a couple Mansfield town properties. 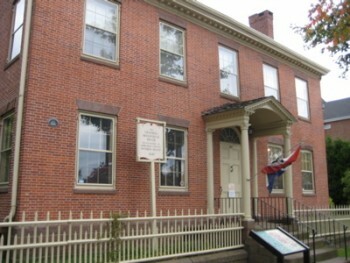 I must mention Mansfield’s absolutely excellent online trail guides. Easy to navigate, simple to read and yet informative and factual. I am hugely impressed with the care and effort Mansfield has made. The first town tract I’d hike through was Sawmill Brook Preserve. Did I say hike? I meant swim. Oh it was raining alright. Absolutely POURING. You would have enjoyed seeing me preparing my little workhorse of a camera in my pocket of my waterproof jacket within the Ziploc bag I keep it in during rain to take such wondrous and important pictures as all those you see on this page. Ooh, look, a giant flat rock next to a more upright rock! 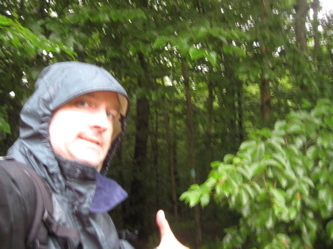 Never mind the deluge, I must get a shot of that! That’s how I roll. This whole first southern section is pretty much flat, save for a few small hills. In fact, the first mile or two are almost completely flat, all the way to Wolf Rock. I passed a nice marsh with beaver evidence, but the typical marshland birds were all holed up in the storm. Wimps. This is rock that looks like a chair. You can’t really see it, but it’s there. I wish you could see and sense how hard it was raining at certain points. It became laughable at times, as it was raining so hard that I couldn’t see more than 20 feet in front of me and was so loud it was amazing. 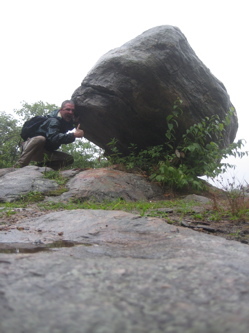 Fortunately, as I said, the rain sort of took a break as I wound my way up to Wolf Rock. While the Walk Book notes that the “climb” is “steep,” it’s also only about 20 yards long. Not exactly lung-busting stuff. I’m sure it’s a pretty view from the top in better weather. The Mansfield guide calls it “breathtaking” and notes that one can see the campus of Eastern CT State University on clearer days. 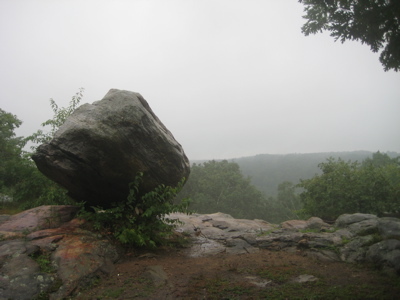 However, it’s not the view up here that you should come for – it’s the cool giant glacial erratic boulder perched near the edge of the cliff. It’s almost hard to imagine how a glacier deposited it here, atop a 40-foot cliff (and how it hasn’t fallen at some point over the last 10,000 years or whatever), so it’s pretty fun to see up there. 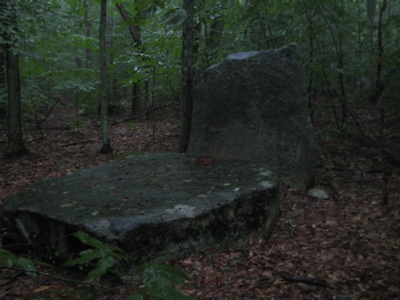 Wolf Rock is mentioned in town deeds dating back to the late 18th century and it one of Mansfield’s most prominent landmarks. I don’t know why it’s called Wolf Rock, but my guess is that it’s for the same reason Wolf Trees are called Wolf Trees – that is, they are large, lone and prominent. 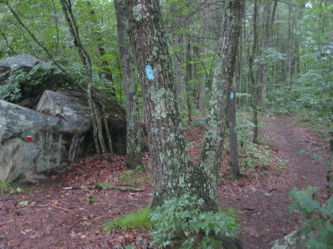 Off the back of the little Wolf Rock rise, the trail descends to cross a couple roads. After the second road crossing (Browns Road), the trail skirts west of a house and is sort of forced through a scree field and through some wetlands – although on the day I hiked, I guess everything was wetlands. It actually reminded me of the Appalachian Trail in central Pennsylvania, although in Mansfield it ended after only a couple of minutes. Regardless, it takes a special skill to traverse this junk quickly; a skill I think I lost about 10 years ago. At least when wet. 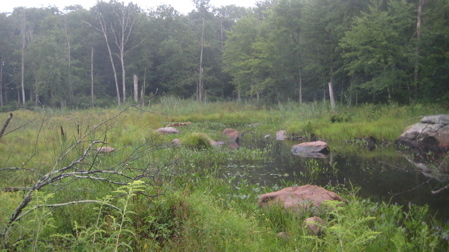 The Nipmuck then enters another Mansfield town park called Schoolhouse Brook Park. It appears to be a nice little park. At 455 acres, it has 8.54 miles of blazed trails (I always love it when they carry it to the 100ths of a mile. 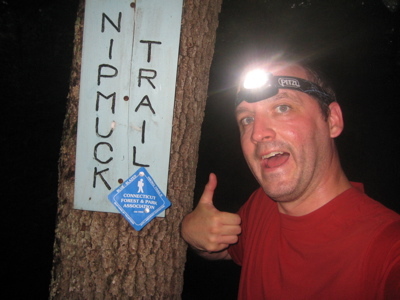 A bunch of trails cross the Nipmuck but the signage is abundant and clearly noted. This was much appreciated at the time as dusk had descended quickly upon me and a thin layer of fog was creeping in. I studied my map and did some quick mental calculations. I decided to turn around at Clover Mill Road instead of continuing on further to route 195 or on to the junction with the other southern tail of the Nipmuck. 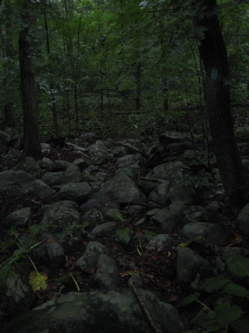 Had I done that, my entire return hike would have been in the dark during a rather insane thunderstorm. I’ll finish up this little section someday (of course I will) and make everyone happy. 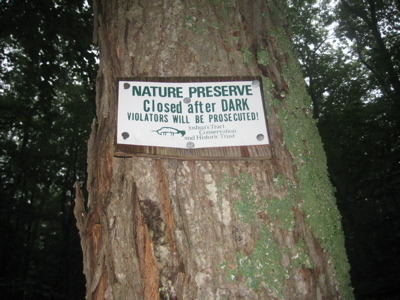 Of course, these signs are in place because I’m sure local kids park and walk up to Wolf Rock at night to go boozing and whatever else comes naturally after that (including falling to their deaths). I think I’d be okay if I got busted. I made it back to my car on Puddin’ Lane and hit the road west to home. During my drive, I was treated to a completely flooded out I-291 across the Connecticut River (due to construction) and a lightning show over the Talcott Ridge that rivaled any 4th of July fireworks I’ve ever seen. While my introduction to the Nipmuck was soggy and truncated, it was enough to get me excited to continue north to the Massachusetts state line in Union where it ends. Bring it on. Indeed, I understand completely the need to return and capture that last little bit.